In this lesson, we’ll take a look at the theory behind the Minor Pentatonic Scale, how it is built, how to apply it to your soloing and a few common fingerings that you can explore in the practice room. 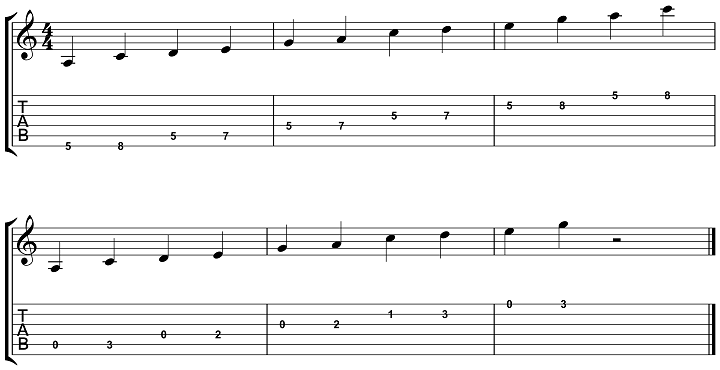 The Minor Pentatonic Scale is built from the following interval pattern. You can see these notes laid out in tab and notation for an A Minor Pentatonic Scale here. You can also think of the Minor Pentatonic Scale as being a fragment of the corresponding Natural Minor Scale. If you have an A Natural Minor Scale, A B C D E F G A, and you take out the 1st, 3rd, 4th, 5th and 7th notes, A C D E G, you now have a Minor Pentatonic Scale. To apply this scale in a soloing situation, you can use the Minor Pentatonic Scale over just about any chord progression, depending on style, and it will work to varying degrees of success. It works over Major and Minor chords, as well as maj7, 7th and m7 chords, which is why it can be used over a variety of progressions when using this scale to build solos on the guitar. To help get you started, here are two common fingerings for the A Minor Pentatonic Scale, one with a 6-string root, and one with a 5-string root. 1. Sing the root note, A for example, and play the corresponding Minor Pentatonic Scales over that root. 2. Play a root note on the guitar, A for example, and then sing the corresponding Minor Pentatonic Scale over that root note. 3. Say the note names, or interval numbers, such as A C D E G or 1 b3 4 5 b7, as you play and sing the notes in the above exercises. 4. Put on a static vamp, A7, A, Am, Am7 or Amaj7 for example, and practice soloing over those chords using the related Minor 5. Pentatonic Scale as the basis for your solo. 6. Repeat any/all of the above exercises in all 12 keys. Do you have a question or comment about Minor Pentatonic Scales? If so, share them in the comments section below this thread.